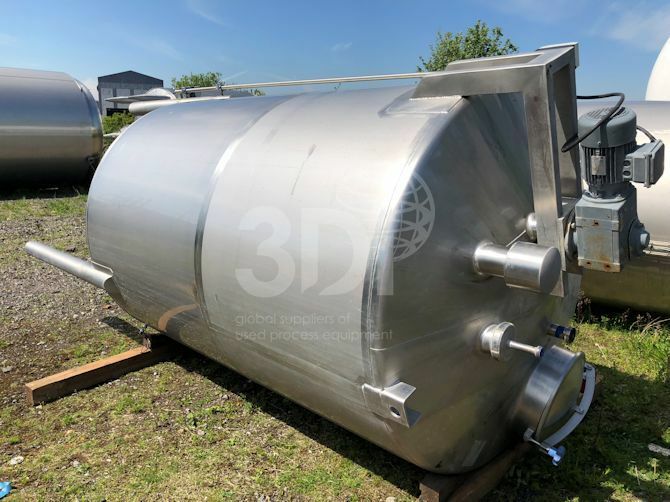 Used 4,500 Litre Stainless Steel Mixing Vessel, manufactured by Progresso, 2003. Material of construction: 316L stainless steel. Orientation: vertical, cylindrical, coned top and bottom. Dimensions: 1600mm diameter, 2250mm on the straight, 200mm coned ends, 4200mm overall height. Connections: (1) 420mm top man way, (2) 50mm top inlet, (2) 100mm top inlet, (1) 100mm top vent, (1) 60mm bottom outlet. Vessel is support with (4) stainless steel legs. Vessel is fitted with spray ball and top mounted off centre twin blade paddle agitator, powered by a 0.75kw Nord electric motor. Previously used in the food and beverage industry.